"Valleau Cemetery" - 12" X 9", Watercolor and Gouache Over Pencil on White Paper. 2019. Available, Inquire Through Our Contact Page. "Valleau Cemetery" - 9" X 12", Watercolor Over Pencil on White Paper. 2019. Available, Inquire Through Our Contact Page. "Living Room" - 7" X 10", Watercolor Over Pencil on White Paper. 2019. Collection of the Artist, NFS. "Watermelon" - 3.5" X 5.5", Watercolor, Gouache and Acryla Gouache Over Pencil on White Paper. 2019. Sketchbook, NFS. "Jett" - 7" X 5", Watercolor, Gouache and Acryla Gouache Over Pencil on White Paper. 2019. Private Collection, Commission, Gift. "My Bonneville T100, Vermeer III" - 7" X 10", Watercolor, Gouache and Acryla Gouache Over Pencil on White Paper. 2019. Collection of the Artist, NFS. "Dad" - 3.5" X 5.5", Watercolor Over Pencil on White Paper. 2019. Sketchbook, NFS. "Rainy Day, Back Deck" - 5.5" X 8", Watercolor Over Pencil on White Paper. 2019. Sketchbook, NFS. 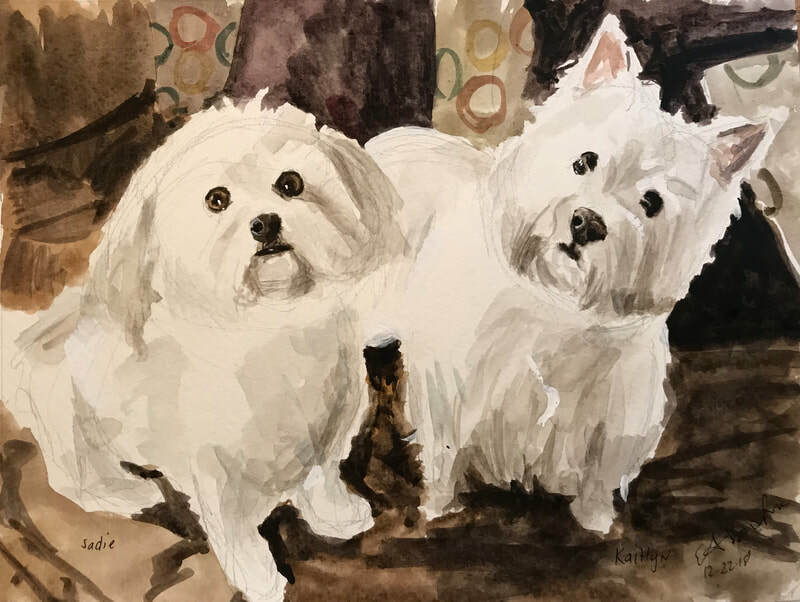 "Dogs at Beach" - 5.5" X 8", Watercolor and Gouache Over Pencil on White Paper. 2019. Sketchbook, NFS. "Dog's Eye Study" - 5.5" X 8", Watercolor, Gouache and Acryla Gouache Over Pencil on White Paper. 2019. Sketchbook, NFS. "Puppy" - 5.5" X 8", Watercolor and Gouache Over Pencil on White Paper. 2019. Sketchbook, NFS. "Bathtub" - 8" X 5.5", Watercolor and Gouache Over Pencil on White Paper. 2019. Sketchbook, NFS. "Living Room Light" - 5.5" X 8", Watercolor Over Pencil on White Paper. 2019. Sketchbook, NFS. "Dining Room" - 5.5" X 8", Watercolor, Gouache and Acryla Gouache Over Pencil on White Paper. 2019. Sketchbook, NFS. "Sorolla's Bowl" - 8" X 5.5", Watercolor and Gouache Over Pencil on White Paper. 2019. Sketchbook, NFS. "Living Room" - 5.5" X 8", Watercolor Over Pencil on White Paper. 2019. Sketchbook, NFS. "Mom Crocheting" - 13" X 9.5", Watercolor Over Pencil on White Paper. 2019. Collection of the Artist, NFS. "Maea Asleep on Table" - 5.5" X 8", Watercolor Over Pencil on White Paper. 2019. Sketchbook, NFS. "Candelabra" - 10" X 8", Watercolor Over Pencil on White Paper. 2018. Private Collection, Gift. "Stained Glass Lamp" - 8" X 10", Watercolor and Gouache Over Pencil on White Paper. 2018. Collection of the Artist, NFS. "Grapefruit Tree in Window" - 8" X 10", Watercolor Over Pencil on White Paper. 2018. Collection of the Artist, NFS. "Houseplant by Window" - 8" X 5.5", Watercolor Over Pencil on White Paper. 2018. Sketchbook, NFS. "Sadie & Kaitlyn" - 9" X 12", Watercolor and Acryla Gouache Over Pencil on White Paper. 2018. Private Collection, Commission, SOLD. "Jack & Sally" - 8" X 10", Watercolor and Acryla Gouache Over Pencil on White Paper. 2018. Private Collection, Commission, SOLD. "Snow on Roof" - 8" X 5.5", Watercolor Over Pencil on White Paper. 2018. Sketchbook, NFS. "Backyard lantern" - 8" X 5.5", Watercolor Over Pencil on White Paper. 2018. Sketchbook, NFS. "Pewter" - 8.25" X 5", Watercolor Over Pencil on White Paper. 2018. Sketchbook, NFS. "Living Room Jasmine " - 5" X 8.25", Watercolor and Gouache Over Pencil on White Paper. 2018. Sketchbook, NFS. "Water Filled Fire pit " - 5" X 8.25", Watercolor and Gouache on White Paper. 2018. Sketchbook, NFS. "Backyard Sun Green" - 7" X 5", Watercolor on White Paper. 2018. Sketchbook, NFS. "Copper Watering Can and Flower Pots" - 7" X 5", Watercolor Over Pencil on White Paper. 2018. AVAILABLE. "Fish Bowl and House Plant" - 7" X 5", Watercolor Over Pencil on White Paper. 2018. AVAILABLE. 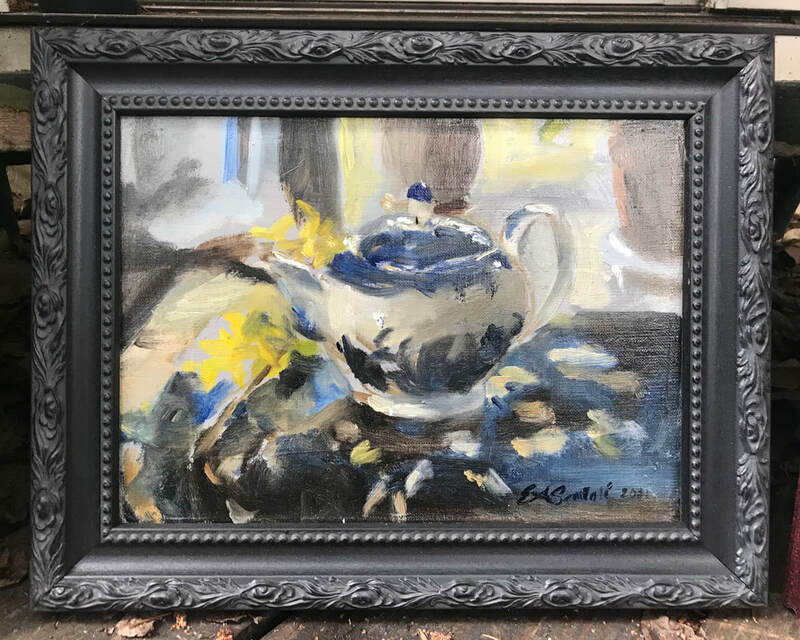 "English Teapot" - 7" X 5", Watercolor Over Pencil on White Paper. 2018. AVAILABLE. "Antique Mirror" - 6" X 4", Watercolor Over Pencil on White Paper. 2018. AVAILABLE. "Wood Pile" - 8" X 10", Watercolor Over Pencil on White Paper. 2018. AVAILABLE. "Purple Mums" - 10" X 8", Watercolor Over Pencil on White Paper. 2018. AVAILABLE through Alfa Art Gallery. "Purple Mums" - 5" X 8.25", Watercolor Over Pencil on White Paper. 2018. Sketchbook, NFS. "Koi Fish" - 5" X 8.25", Watercolor and Acryla Gouache Over Pencil on White Paper. 2018. Sketchbook, NFS. "Watermelon Plants" - 6.25" X 11.25", Watercolor Over Pencil on White Paper. 2018. Sketchbook, NFS. "Puppy in Leaves" - 5" X 8.25", Watercolor and Acryla Gouache Over Pencil on White Paper. 2018. Sketchbook, NFS. 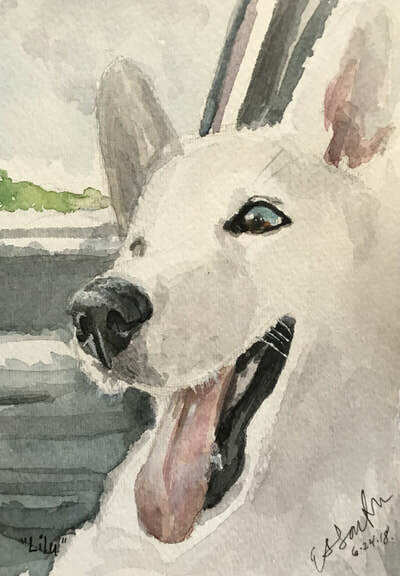 "German Shepherd" - 5" X 8.25", Watercolor Over Pencil on White Paper. 2018. Sketchbook, NFS. "Husky Puppy" - 5" X 8.25", Watercolor and Acryla Gouache Over Pencil on White Paper. 2018. Sketchbook, NFS. "Wet Day" - 5" X 8.25", Watercolor and Acryla Gouache Over Pencil on White Paper. 2018. Sketchbook, NFS. "Bulldog" - 5" X 8.25", Watercolor Over Pencil on White Paper. 2018. Sketchbook, NFS. "Collie" - 5" X 8.25", Watercolor and Acryla Gouache Over Pencil on White Paper. 2018. Sketchbook, NFS. 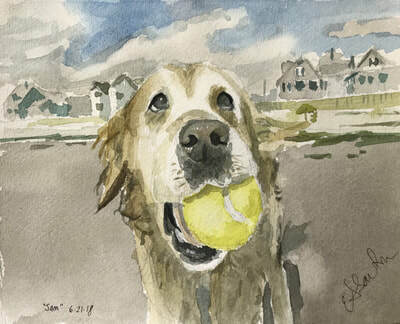 "Beach Dog Sketch" - 5" X 8.25", Watercolor and Acryla Gouache Over Pencil on White Paper. 2018. Sketchbook, NFS. "Beach Sketch" - 5" X 8.25", Watercolor and Acryla Gouache Over Pencil on White Paper. 2018. Sketchbook, NFS. "Piggy" - 5" X 8.25", Watercolor and Acryla Gouache Over Pencil on White Paper. 2018. Sketchbook, NFS. "Collie on Beach" - 5" X 8.25", Watercolor and Acryla Gouache Over Pencil on White Paper. 2018. Sketchbook, NFS. "Kitt" - 8" X 10", Watercolor and Acryla Gouache Over Pencil on White Paper. 2018. Private Collection, Commission, SOLD. 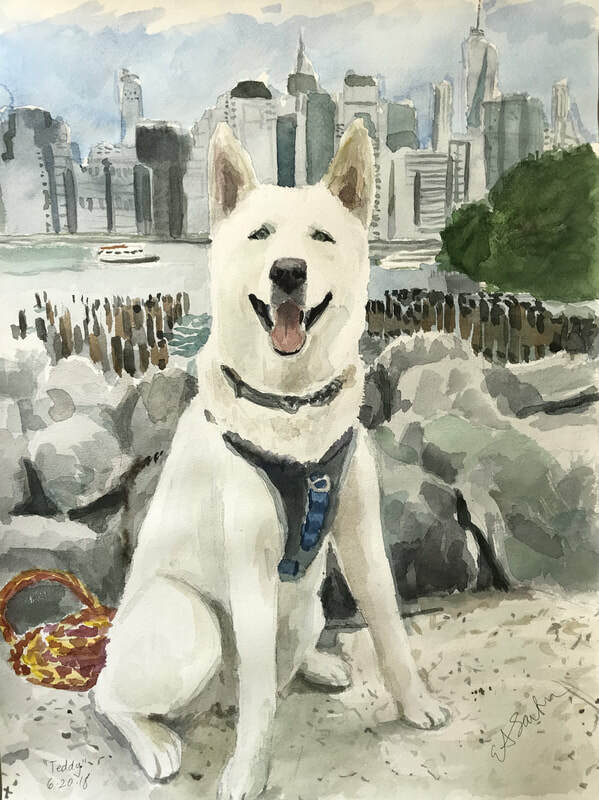 "Samoyed on Beach" - 5" X 8.25", Watercolor and Acryla Gouache Over Pencil on White Paper. 2018. Sketchbook, NFS. "Mau" - 7.5" X 8.5", Watercolor and Acryla Gouache Over Pencil on White Paper, 2018. Private Collection, Gift. 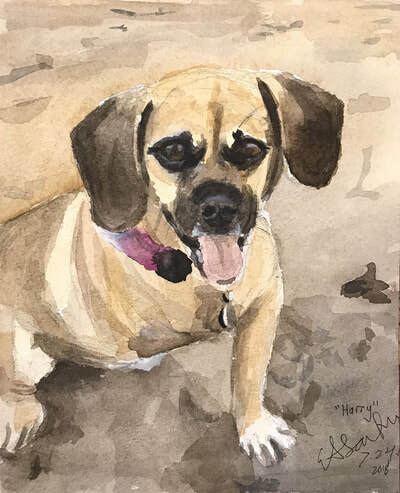 "Beagle" - 5" X 8.25", Watercolor Over Pencil on White Paper. 2018. Sketchbook, NFS. "Gabe" - 10" X 8", Watercolor and Acryla Gouache Over Pencil on White Paper. 2018. Private Collection, Commission, SOLD. "Maneka" - 5" X 8.25", Watercolor Over Pencil on White Paper. 2018. Sketchbook, NFS. "Peyton" - 14" X 11", Watercolor and Acryla Gouache Over Pencil on White Paper. 2018. Private Collection, Commission, SOLD. "Tiffany" - 7" X 5", Watercolor and Acryla Gouache Over Pencil on White Paper. 2018. Private Collection, Commission, SOLD. "Harry" - 10" X 8", Watercolor and Gouache Over Pencil on White Paper. 2018. Private Collection, Commission, SOLD. "Meg" - 10" X 8", Watercolor and Acryla Gouache Over Pencil on White Paper. 2018. Private Collection, Commission, SOLD. 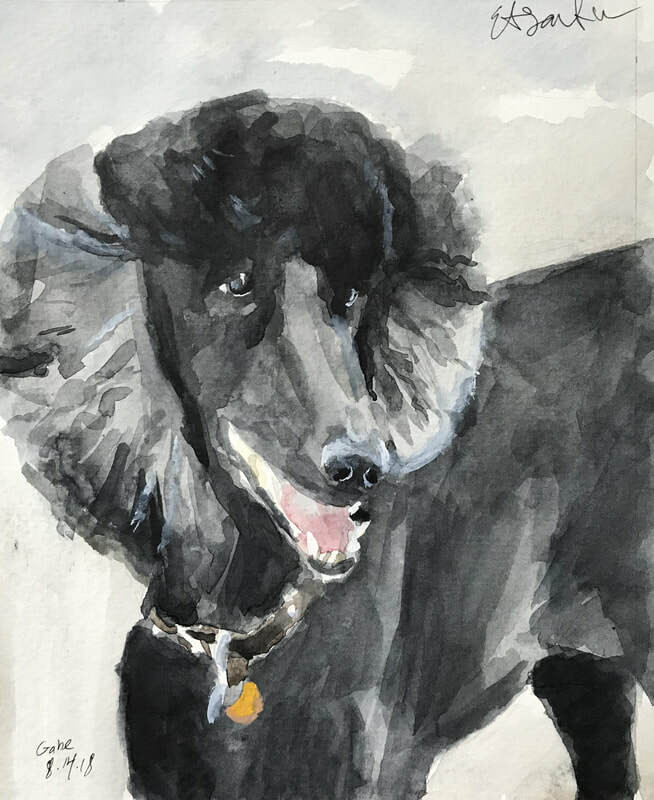 "Murphy" - 10" X 8", Watercolor and Acryla Gouache Over Pencil on White Paper. 2018. Private Collection, Commission, SOLD. "Nilla" - 12" X 9", Watercolor and Gouache Over Pencil on White Paper. 2018. Private Collection, Commission, SOLD. 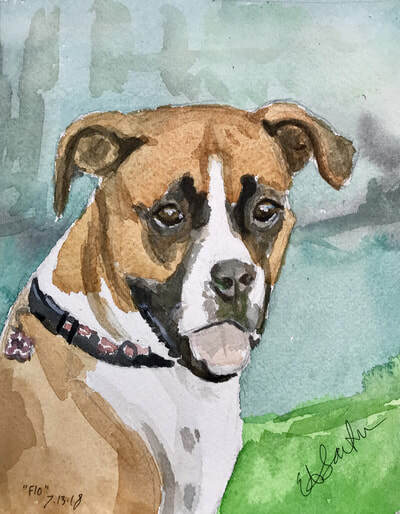 "Chloe" - 10" X 8", Watercolor and Gouache Over Pencil on White Paper. 2018. Private Collection, Commission, SOLD. "Flo" - 10" X 8", Watercolor and Gouache Over Pencil on White Paper. 2018. Private Collection, Commission, SOLD. "Jax" - 10" X 8", Watercolor Over Pencil on White Paper. 2018. Private Collection, Commission, SOLD. 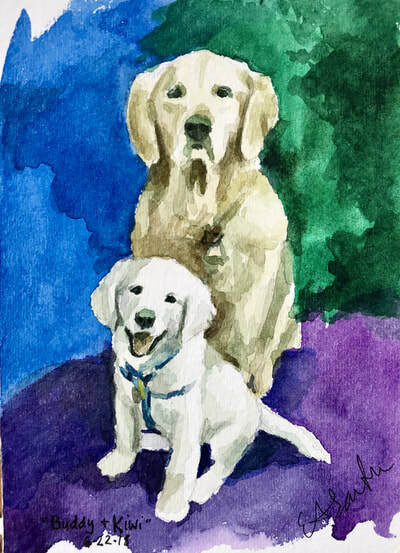 "Kimi and Mika" - 12" X 9", Watercolor and Gouache Over Pencil on White Paper. 2018. Private Collection, Commission, SOLD. "Diesel and Sky" - 10" X 8", Watercolor and Gouache Over Pencil on White Paper. 2018. Private Collection, Commission, SOLD. "Cooper" - 7" X 5", Watercolor Over Pencil on White Paper. 2018. Private Collection, Commission, SOLD. "Lilu" - 7" X 5", Watercolor and Gouache Over Pencil on White Paper. 2018. Private Collection, Commission, SOLD. "Buddy and Kiwi" - 7" X 5", Watercolor Over Pencil on White Paper. 2018. Private Collection, Commission, SOLD. "Sam" - 8" X 10", Watercolor and Gouache Over Pencil on White Paper. 2018. Private Collection, Commission, SOLD. 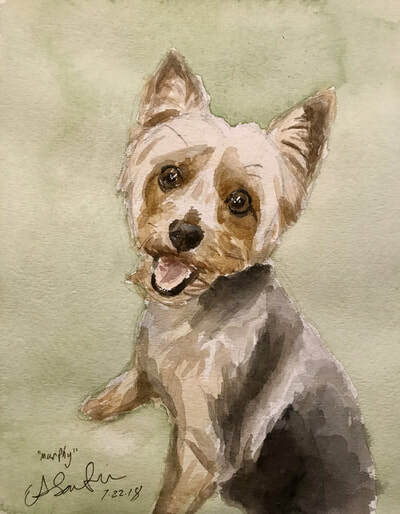 "Teddy" - 24" X 18", Watercolor Over Pencil on White Paper. 2018. Private Collection, Commission, SOLD. 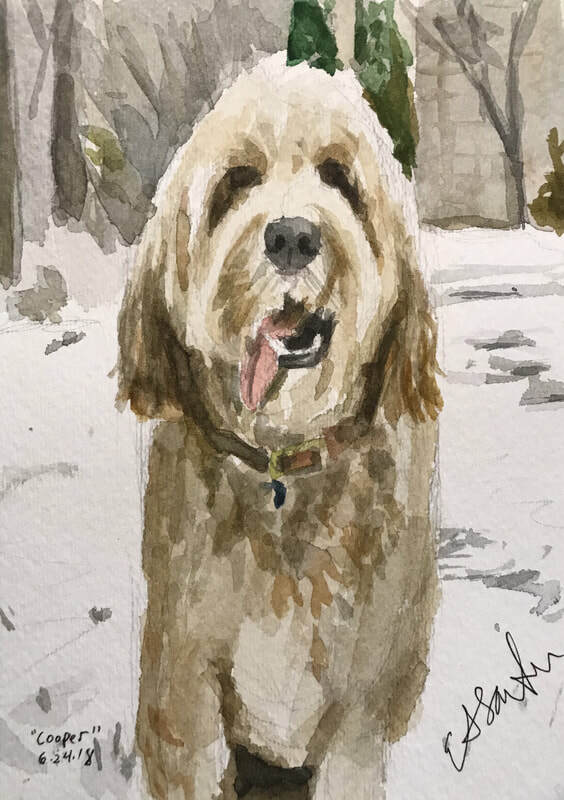 "Gryffin" - 7" X 5", Watercolor Over Pencil on White Paper. 2018. Private Collection, Commission, SOLD. "Abby" - 10" X 8", Watercolor Over Pencil on White Paper. 2018. Private Collection, Commission, SOLD. "Star Fox" - 10" X 8", Watercolor Over Pencil on White Paper. 2018. Private Collection, Commission, SOLD. 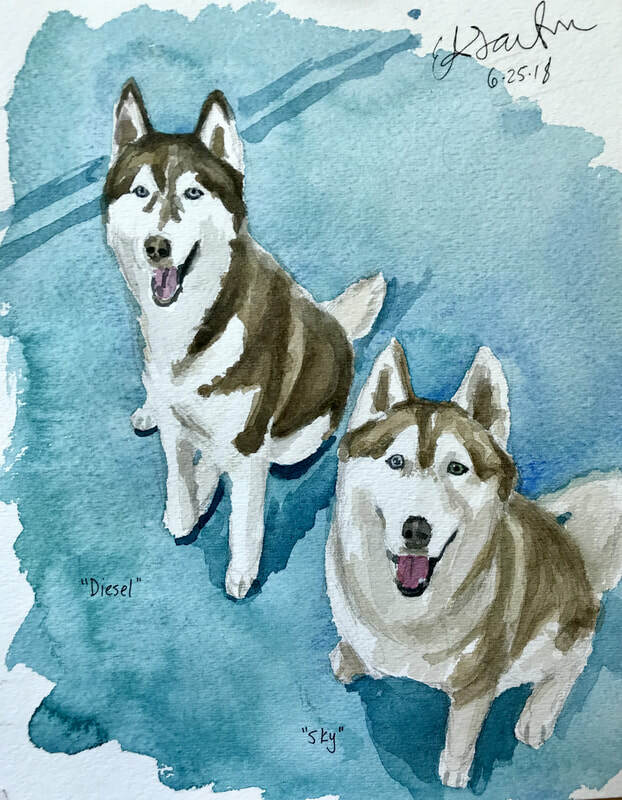 "Nanuq and Ducati" - 5" X 7", Watercolor Over Pencil on White Paper. 2018. Private Collection, Commission, SOLD. "Ruby" - 10" X 8", Watercolor Over Pencil on White Paper. 2018. Private Collection, Commission, SOLD. 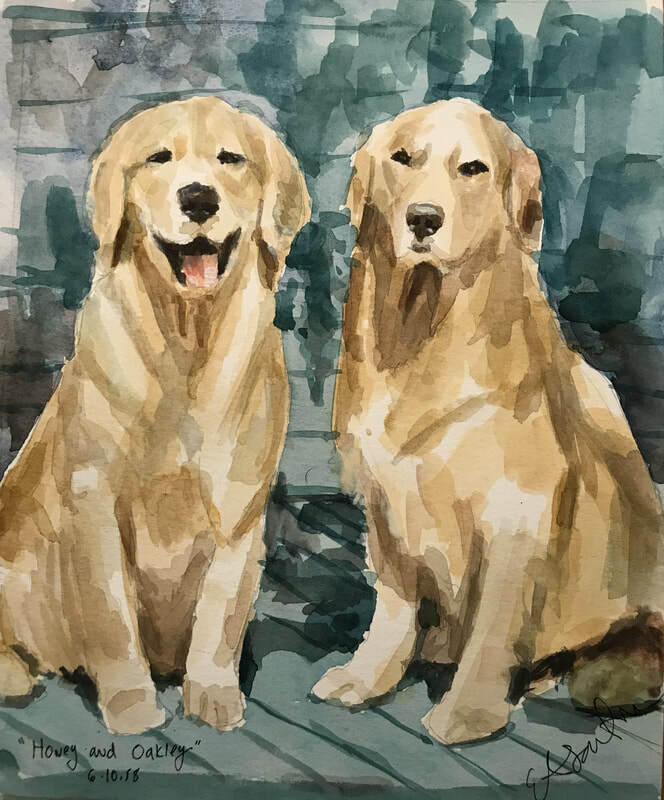 "Honey and Oakley" - 10" X 8", Watercolor Over Pencil on White Paper. 2018. Private Collection, Commission, SOLD. 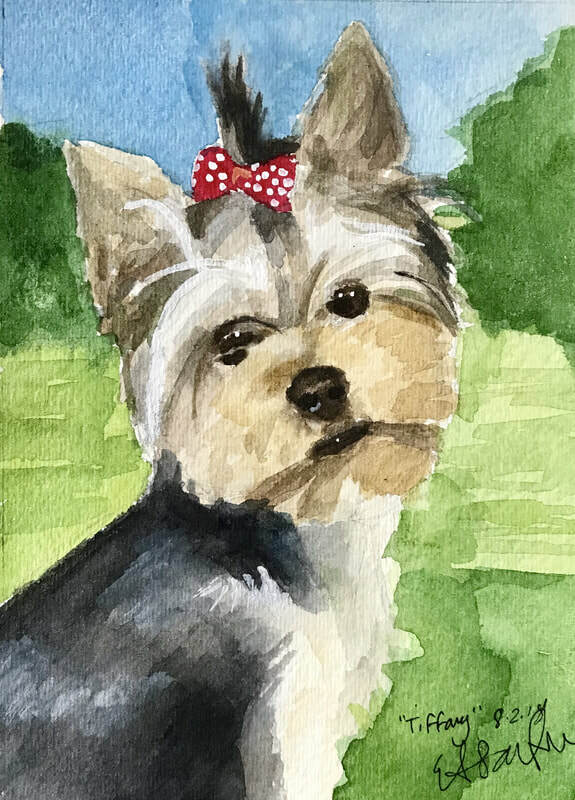 "Zoey" - 12" X 9", Watercolor Over Pencil on White Paper. 2018. Private Collection, Commission, SOLD. 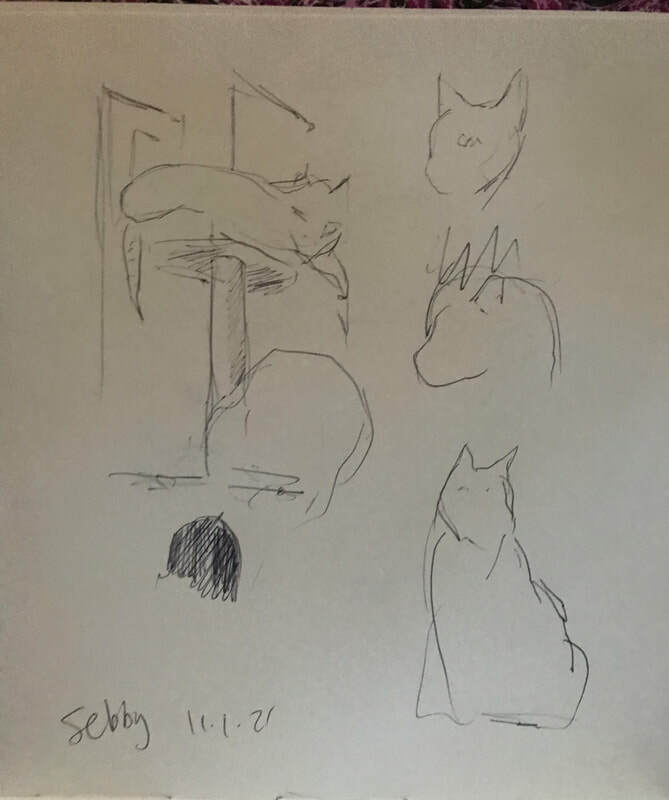 "Living Room Window" - 8.25" X 5", Watercolor Over Pencil on White Paper. 2018. Sketchbook, NFS. "Rainy Day, Back Deck" - 5" X 8.25", Watercolor Over Pencil on White Paper. 2018. Sketchbook, NFS. "Bronco Buster" - 5" X 8.25", Watercolor Over Pencil on White Paper. 2018. Sketchbook, NFS. "Flower Pots" - 5" X 8.25", Watercolor Over Pencil on White Paper. 2018. Sketchbook, NFS. "Petunias" - 5" X 8.25", Watercolor Over Pencil on White Paper. 2018. Sketchbook, NFS. "Living Room Lamp" - 5" X 8.25", Watercolor Over Pencil on White Paper. 2018. Sketchbook, NFS. "Pink Flowers + Grass" - 5" X 8.25", Watercolor Over Pencil on White Paper. 2018. Sketchbook, NFS. 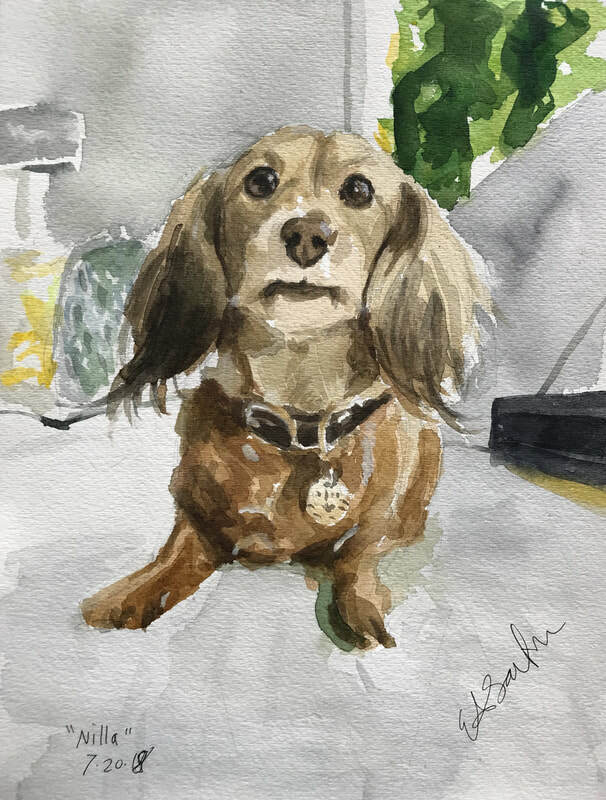 "Rookie" - 10" X 8", Watercolor Over Pencil on White Paper. 2018. Private Collection, Commission, SOLD. "Dining Room, Sideboard" - 5" X 8.25", Watercolor Over Pencil on White Paper. 2018. Sketchbook, NFS. "Homestead Purple Verbena" - 18" X 20", Watercolor and Gouache Over Pencil on White Paper. 2018. Private Collection, Commission, SOLD. "Dalmatian" - 16" X 12", Watercolor Over Pencil on White Paper. 2018. AVAILABLE. "Sketches of Purple Flowers" - 9" X 12", Watercolor Over Pencil on White Paper. 2018. AVAILABLE. "Puppy Birthday Card" - 6" X 4.5", Watercolor Over Pencil on White Paper, 2018. Private Collection, Gift. "Fireplace" - 6" X 9", Watercolor on White Paper. 2018. Sketchbook, NFS. "Pineapple Thank You Card" - 3.75" X 5", Poster Paint Over Pencil on White Paper, 2018. Private Collection, Gift. "Butterfly Thank You Card" - 4.25" X 4.25", Poster Paint Over Pencil on White Paper, 2018. Private Collection, Gift. "Valentine" - 9" X 8" (heart shape), Poster Paint Over Pencil on White Paper, Gold Ribbon and Gold Foil. 2018. Private Collection, Gift. "Christmas Card" - 3.75" X 5", Watercolor Over Pencil on White Paper. 2017, Private Collection, Gift. "Yellow Flowers" - 7.5" X 11", Watercolor Over Pencil on White Paper. 2017, AVAILABLE. "Roman Fountain" - 11" X 7", Watercolor Over Pencil on White Paper. 2017, AVAILABLE. "Maea" - 9" X 12", Watercolor Over Pencil on White Paper. 2017. Collection of the Artist, NFS. "Bernese Mountain Dog Puppy" - 9" X 12", Watercolor Over Pencil on White Paper. 2017. AVAILABLE. "Mushrooms" - 6" X 9", Watercolor Over Pencil on White Paper. 2016. Sketchbook, NFS. "Daisies" - 6" X 9", Watercolor Over Pencil on White Paper. 2016. Sketchbook, NFS. "Bees and Thistle" - 9" X 6", Watercolor Over Pencil on White Paper. 2015. Sketchbook, NFS. "Dinosaur Sketches" - 6" X 9", Watercolor and Pencil on White Paper. 2015. Sketchbook, NFS.